Robert Cannon is a partner in the Capital Markets Group in Cadwalader's London office. He focuses on structured finance and securitisation, and has acted for arrangers, originators and asset managers on transactions involving a variety of structures and asset classes, including CDOs, CLOs, mortgage securitisations and commercial paper conduits. 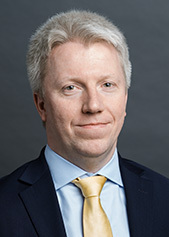 Prior to joining Cadwalader in 2007, Robert worked in the structured finance practice at Clifford Chance's London office for two and a half years and, prior to that, in the banking and financial services group at Matheson Ormsby Prentice in Dublin. Robert received an undergraduate degree in law from Trinity College, Dublin in 1999 and a master's degree in law from the University of Oxford in 2000. He qualified as a solicitor in Ireland in 2003 and was awarded the Irish Law Society prize for the highest grade in his year in Commercial Law. He is admitted to practice in England and Wales since 2004.